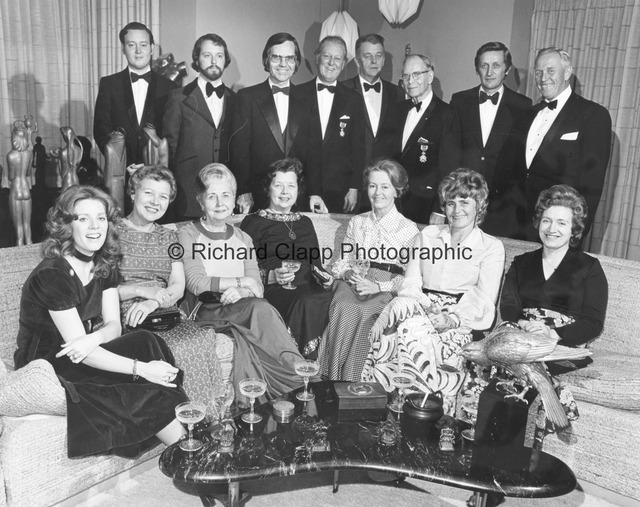 Seated from left to right: Mrs. Christopher Fredericks, Mrs. Harri Virjo, Mrs. William Henry Caswell, Mrs. Ingvald Ordheim, Mrs. Rosalind Fredericks, Mrs. William Henry Caswell III and Mrs. Norval Engelsen. Stading from left to right: Carl M. Fredericks, Dr. Christopher Fredericks, Norwegian Vice Consul William Henry Caswell III, Danish Consul Marshall M. Fredericks, Ingvald Ordheim, Dr. William Henry Caswell, Norwegian Consul Norval Engelsen and Finnish Consul Harri Virjo. Richard Clapp Photographic, “Guests at the reception honoring Marshall Fredericks' conferment as a member of the Knighthood of the Royal Norwegian Order of St. Olav,” Marshall M. Fredericks Sculpture Museum, accessed April 24, 2019, http://omeka.svsu.edu/items/show/4976.